Besides the decision of setting up of the hotline, a long-negotiated defence pact - Communications, Compatibility, Security Agreement (COMCASA). The two countries will closely monitor the implementation of the decisions taken during the 2+2 dialogue. India and US on Thursday decided to set up a hotline between their foreign and defence ministers and closely monitor the implementation of the decisions taken at the first 2+2 dialogue in New Delhi. The announcement was made by External Affairs Minister Sushma Swaraj after the 2+2 dialogue in New Delhi, during which she along with Defence Minister Nirmala Sitharaman held wide-ranging deliberations with US Secretary of State MikePompeo and Defence Secretary James Mattis. "We have decided to closely monitor the implementation of the decisions taken today. 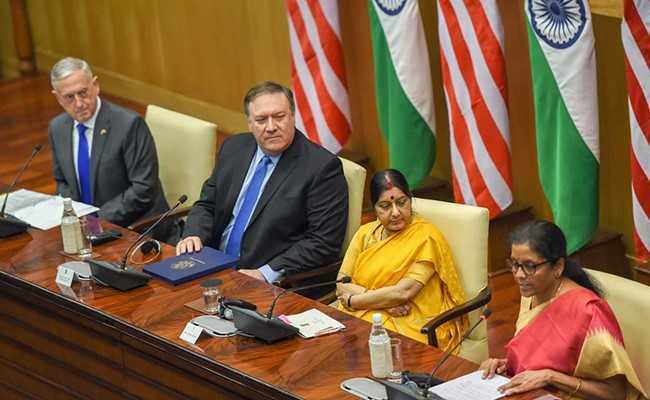 A decision has been take to establish a hotline between both the foreign ministers and defence ministers through which Secretary Pompeo and I, Secretary Mattis and Nirmala ji, will be able to stay in touch constantly," Ms Swaraj said. Besides the decision of setting up of the hotline, a long-negotiated defence pact - Communications, Compatibility, Security Agreement (COMCASA) - was also inked, and key issues, including cross-border terrorism, India's NSG bid and the contentious H1B visa issue, were discussed during the dialogue.